When Alan and I first began camping, we were just young kids starting out in our life together. We were saving to build a house and didn’t have much money to spend on travel. But we loved the idea of road trips and, by choosing to tent camp at that stage of our lives, we were able to cover our living expenses, save for the house and still give in to our wanderlust as often as our jobs would allow. At that point, tent camping was absolutely the best option for us and we continued to camp that way for more than 15 years. We took a break from camping entirely for about 10 years when the kids were very young but, when we were ready to jump back in, we faced a dilemma. Alan and I had a fairly large tent, one that would easily accommodate our family of four, but we knew in our hearts that our “growing older bones” would no longer tolerate sleeping on the ground, no matter how many air mattresses they had under them. Then there was the selfish thought that we would just love to have our own bathroom and shower. So, we started thinking about a pop-up – also known as a tent camper. I’m finding that different types of “campers” have different names, depending on what part of the country you’re having the conversation in. I recently found out that travel trailers are simply called “trailers” in at least one part of the pacific northwest, although if we refer to a “trailer” back east it often means a utility trailer or a tractor trailer. As I understand it, “campers” out west tend to be truck campers not travel trailers. But, I digress. (I do that a lot, so consider yourselves forewarned.) Since we were in the process of shopping for a new vehicle, we figured it would be a good idea to check out pop-ups to see how much they weighed. It would be pretty foolish to buy a new vehicle that couldn’t tow the kind of camper we were considering buying in the future. We stopped at our local RV dealer to take a peek at the weights of a couple of pop-ups and decided that the “deluxe” model was right up our alley. It had a hard-sided bathroom that folded down for travel (nice!) and the bathroom itself was large enough that my big guy Alan felt comfortable in it. It came with a very “deluxe” price tag, also - $14,500. YIKES! (My kids would point out that “Nobody says that anymore, Mom.”) Not believing that this could possibly be indicative of the true cost of a pop-up, Alan and I decided to visit a large Jayco dealer some distance from our home. We looked at pop-ups and, not seeing anything that really tickled our fancy, asked about the next level up. The salesperson showed us a hybrid camper – part hard-sided and part tent camper. Very nice, but the layout wasn’t really helpful. The next level up? Just out of curiosity, of course. (Do you see where this is going? And do you remember that we went out to check the weights of pop-ups, not out to buy one?) At that point, the salesperson explained that a regular travel trailer would be the next step up and he showed us . . . the best camper EVER! Alan and I fell in love all over again - with a 30’ travel trailer! It was gorgeous! We loved the set up with bunks for the kids – perfect! Oh, by the way, the price? $14,000. What?! That was less than the cost of the pop-up we had liked! Alan and I both spoke at the same time - one of us asked if the camper was used and one of us asked what was wrong with it. At that point, the salesperson started laughing and he explained that, since it was one of their most popular models, they ordered it in bulk from Jayco and passed the discount on to their customers. (Apparently, this really annoyed the competitors which, of course, delighted the staff at the Jayco dealership.) So, despite the fact that our little expedition was for the purpose of checking weights only, two days later we signed on the bottom line and became the owners of a brand new travel trailer! But we didn’t really choose this RV – it chose us. Our Jayco Jay Flight 27BH has served us well for over 40,000 miles and we love it to pieces. For our family, in the end, a bunkhouse model travel trailer was the perfect choice. 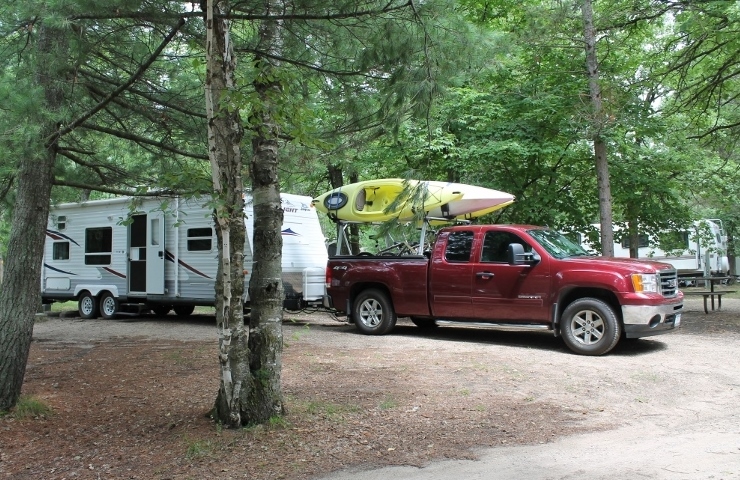 Towing a trailer allowed us to load four bikes and three kayaks (one’s a tandem) on the pickup truck. Once we’re settled in at a campground, we’re able to use the truck to explore the area or easily move our “toys” to where we’ll be using them. A travel trailer was the right choice for us but, if you want something a little smaller that will fit in a regular parking place or a tight campsite, a Class B might be a better choice for you. If you’re looking for more space because you’ll be taking extended trips or living in your RV full time, you might consider a Class A or Class C (with or without a towed car) or a fifth wheel. For those who love to camp off the beaten path and don’t have a large family or need a lot of storage space, maybe a truck camper would be the perfect choice. The beauty of camping is that there’s an option for everyone no matter where or how you intend to camp. If you’re just getting started on the search for the perfect RV, the web site GoRving (link HERE) has an extremely useful section that compares all the different types of RVs on the market. The folks at GoRving also provide a wealth of information about many other aspects of camping, too. They can help you find rentals, campgrounds, dealers and RV shows. Manufacturers of outdoor gear and all types of RVs make it easy for each of us to enjoy the great outdoors in whatever way is most special to us. And that’s just one of the things I love about camping.